The Sportsstuff 53-3004 is a Big Betty series of towables. The towable features dual tow points, utilizing the comfy backrest and the easy grips mounted on the dividers. This comes equipped with comfy EVA foam seating pads. A multitude of foam filled webbing handles with knuckle guards enable lots of different riding positions. Air cushioned sidewalls help keep riders on board. The patented speed safety valve and quick connect saves time. The Betty also feature a heavy-duty K80 PVC bladder and double stitched full nylon cover with self bailing drain vents. 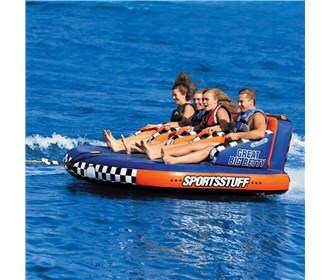 Deflated Dimensions: 93" x 85"
The Sportsstuff Great Big Betty has many exciting features for users of all types. You can extend the lifetime of your Sportsstuff Great Big Betty with the purchase of a FactoryOutletStore Factory Protection Plan. See the Sportsstuff Great Big Betty gallery images above for more product views. The Sportsstuff Great Big Betty is sold as a Brand New Unopened Item.